The aerial parts of annual herbaceous plant Siegesbeckia orientalis L. , S. pubescens Makino or S. glabrescens Makino of family Compositae. Collected before or during blossom in summer and autumn. Dryness, thick stems, leafiness, big and immature branches, flower bud without blossom and bright green in color. Cut into segments, unprocessed or steamed with yellow rice wine for use. Pungent, bitter, cold; liver and kidney meridians entered. Dispel wind-damp, unblock collaterals, clear heat and remove toxicity. Xian, Huang Qi and Dang Gui, etc. The raw products with bitter and cold natures can clear heat-toxin and dispel damp-heat. It can be used singly for oral administration or topical washing, and can also be combined with wind-dispelling, dampness-removing and itching-relieving herbs, such as Bai Ji Li, Di Fu Zi and Bai Xian Pi. 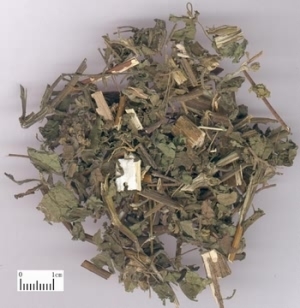 For sore and abscess marked by red swelling and burning pain, t can be combined with heat-clearing and toxicity-removing herbs, for example, Pu Gong Ying and Ye Ju Hua, etc.